In a hypercompetitive, global marketplace protecting your company’s customer base, the lifeblood of your business, must become your number one priority. The rubber hits the road with account managers, project managers, sales professionals, and customer service professionals—the people most connected to customers—who are on the frontlines of customer experience. They build unique and enduring emotional connections with customers that creating long-term revenue and profit streams. 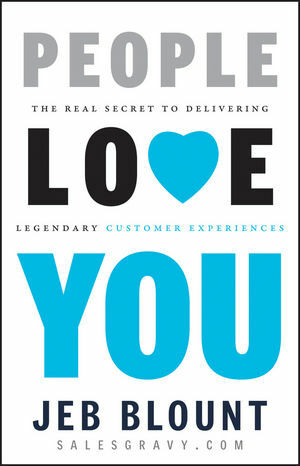 In People Love You, human relationship guru, Jeb Blount, gives you a powerful playbook for interacting with customers in a way that creates deep, enduring, visceral connections that withstand relentless economic and competitive assaults. Jeb Blount is a leading expert on how human relationships impact account management, customer experience, leadership, and sales. He helps many of the world's leading organizations accelerate revenue growth and profits through a focus on interpersonal relationships. He is the author of six books, including People Buy You: The Real Secret to What Matters Most in Business, People Follow You: The Real Secret to What Matters Most in Leadership, and Power Principles. He has published over 100 articles on account management, leadership, and sales, and his audio programs have been downloaded more than 6 million times on iTunes. More than 200,000 business professionals subscribe to his weekly newsletter.